At a playground in Brooklyn, I was introduced to the mother of a friend of my granddaughter. She asked us where we were going during my visit, and my daughter explained that we had to go to Costco. 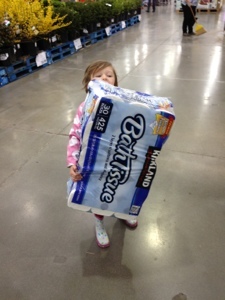 Mother of friend, "I was disappointed in the quality of things, last time I shopped at Costco." Me: "Really? What was it?" "Toilet paper. It was so much flimsier than I'm used to." "That is surprising! Kirkland brand?" "No. I usually buy Kirkland, but I got 'famous-national-brand,' because I was returning some I borrowed from my neighbor, and I didn't want her to think I was being cheap."